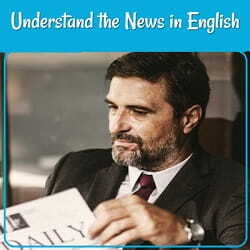 This page continues the discussion of news vocabulary that began in Understanding the News in English. 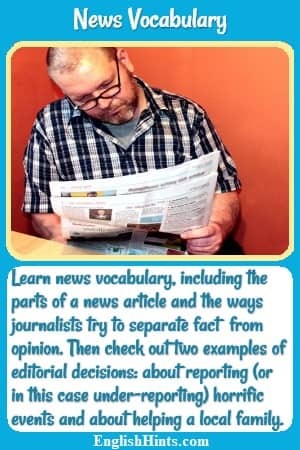 That page talked about different news media (newspapers, magazines, radio, TV, and video), how reporters and journalists find and report the news, and different websites that make it easier to understand English-language news. The featured or lead article will be at the top of the page, often on the far left. It will have the largest headline and pictures to emphasize its importance. Editors are the people who make the decisions about the newspapers’ contents and layout. They highlight the story they think is most important or will interest readers the most. The editors not only decide which stories to feature on the front page, but also which stories deserve in-depth coverage and which should be brief. In the Op Ed section (opinion and editorial) they write editorials to discuss their perspectives on the important issues in the news. They give their thesis-- the main argument or idea they want to present, and then explain why they believe this and why it should matter (be important) to their readers. The Op Ed section is a way to separate opinion from fact, so people will know what parts of the paper are the owners' or editors’ views. Most newspapers make a real effort to keep news reporting in the rest of the paper free from bias. They point out when they are quoting someone’s view or opinion rather than straight facts. They are careful to cite—give the source—of each quotation or fact they present, so readers can judge how trustworthy and believable it is. Accurate citations are part of journalists' ethics-- their values. Each news story is written in paragraphs (a few related sentences at a time). The lead paragraph gives the most important facts (the 5 Ws: who, what, when, where, why-- and also how). It often includes a ‘hook’ as well. A hook is an especially interesting or dramatic description used to keep the reader interested--as a fisherman uses a hook to catch a fish. The following paragraphs add details readers will want or need. 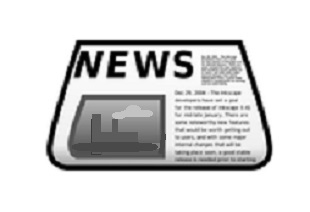 Most newspapers have sections for local news, shopping and advertisements, business, sports, humor (the comics), entertainment, the arts, and travel, as well as national and international news. This 2001 New York Times article discusses that newspaper’s coverage of the Holocaust (the Nazi murder of millions of Jews during World War 2) sixty years earlier. Because the writer is talking about which news that the New York Times chose to emphasize (cover in detail on the front page), he uses many of the words discussed above. As you read the article you can see how they are used in context. At the very end of the 2001 New York Times article is a photo. Its caption (the text under it) talks about a front page article in 1943 covering a conference on what to do about refugees. A very small “appended article” reported the execution of two million Jews. The author’s point is that the 1943 coverage devoted much more space to a government conference than to a huge massacre that would normally be front page news for weeks. It meant that the New York Times in the 1940s did report a few times about what the Nazis were doing to the Jews, but it almost hid those mentions in the back pages of the paper. Editors worried that they might appear to be giving the Jews special treatment. Instead, they (and other American news media) gave very little information, and most Americans had no idea that millions of Jews were being killed. Incidentally, Vocabulary for Violence explains more of the news vocabulary of the New York Times' Holocaust article. (It's vocabulary that is sadly common in other news as well, since so much of news reporting involves conflict and violence.) That page will probably help if you are finding the Times' article difficult to understand. A lot of news is about disasters and people doing terrible things to each other. Journalists also write about the good things people do. This is a story about compassion (caring about someone who is suffering). In it a reporter remembers his old supervisor (the “city editor” for local news at his newspaper) and the lesson he taught about what is really important in the news and in life. The reporter was writing a sad story for Christmas about a dying boy who wanted to eat a peach. In those days stores did not carry fruit from other countries, and peaches only ripen in the summer, so the reporter believed it was impossible to get peaches for the boy. His supervisor, Al, called him. Al had been drinking (alcohol— more than was good for him) and his speech was “slurred”—unclear, run-together, and hard to understand. However, the reporter understood when Al asked how long the boy might live (a day or two, according to his doctor.) Al told him to get some peaches for the boy. So Al gave him the phone number of the top official in charge of agriculture in the U.S.—and that official said he would make sure the peaches could pass inspection and be given to the boy. Finally the reporter said if he made those arrangements first, the story would be too late for Christmas—at least in the newspapers that would be sold outside the city. Al answered “I didn't say get the story. I said get the kid his peaches.” That taught the writer a lesson in priorities—in what is most important—that he never forgot. I hope the explanation and examples of news vocabulary here and on How to Understand the News in English and Vocabulary for Violence will help as you read the news in English. Remember that you don't usually need to understand every word perfectly. Check out English Reading Comprehension and Listening and Reading Comprehension Exercises for more hints and practice. Home> Learn English Vocabulary> News Vocabulary. Understand the way news is reported in English-speaking countries, with links to fairly easy news sites. 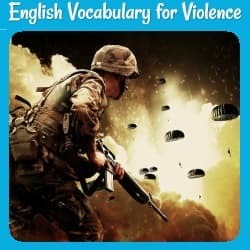 You'll need English vocabulary for violence if you want to study history or the news in English. You can learn & practice it here.